FREE Panel Discussion Coming Up in March! Do you want to expand your potential in the open water? Whether your dream is to swim one mile, ten miles, or more, this FREE panel discussion will provide tips and techniques to achieve your dreams. All genders, swim abilities, and athletic passions are welcome. 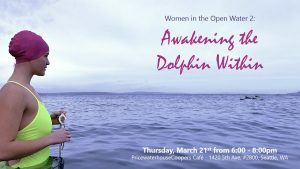 Hosted by Melissa Kegler, Triple Crown* Mermaid, and Guila Muir, Founder, Say Yes to Life Swims. 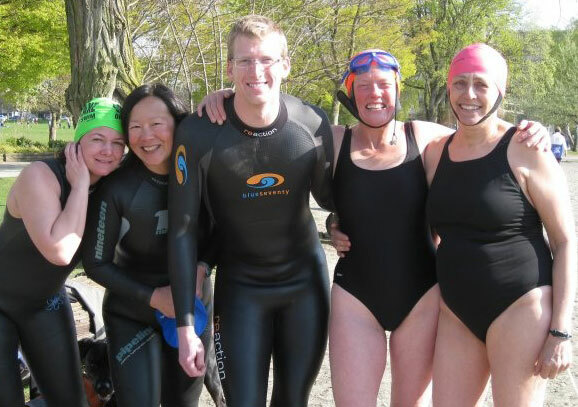 Expect to meet other swimmers, explore local options, and celebrate the open water swimming community in all its forms. Thanks to Price Waterhouse Cooper’s WIN (Women’s Inclusion Network) for donating delicious snacks. We’ll have a super-cool raffle, as well! • How can I overcome my self-limiting beliefs? • What are longer relays? How do they work? • How should I prepare to swim longer distances? The café is in the US Bank Centre Building. 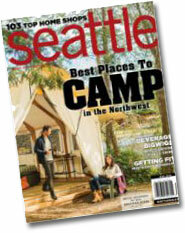 The space is easily accessible by light rail (Westlake Station) and bus. Parking is available in the building and in nearby lots. 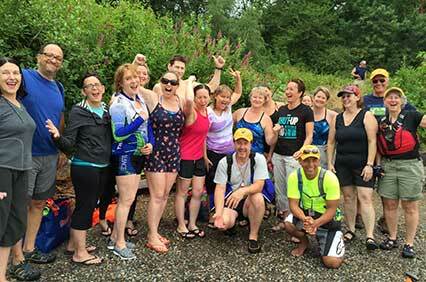 Say Yes to Life Swims is the Northwest’s premiere source of open water swim tourism and adventures. Since 2011, we’ve been providing a world in which all swimmers experience challenge, exhilaration, and camaraderie. 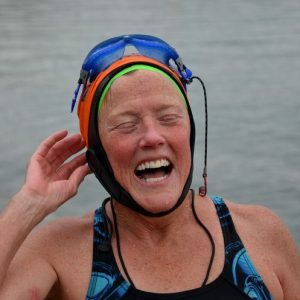 *The “Triple Crown” designation indicates that Melissa has completed three historically important swims: The English Channel, (33.7 km) the Manhattan Island Marathon Swim, (48.5 km) and the Catalina Channel Swim (32.5 K). Basically, it means that Melissa is an animal. I came to swimming later in life. All its aspects fascinated me, so I embarked on my own informal “adult learning project”, which continues through today. My project includes reading everything I can get my hands on, particularly about open water swimming, as well as interviewing swim teachers about their views, beliefs, and approaches. It’s true that the human form, with its powerful gluteal muscles, excels at running. Thanks to being primates, we’re also good climbers. In living our lives day-to-day, we primarily keep our bodies vertical, moving in the sagittal plane. In fact, drowning people typically keep their bodies vertical as they try to “climb” out of the water. Busting the Myth: We Are Built to Swim! However, these facts have little to do with the fact that our bodies are as designed to swim. People have been swimming since there were people on earth. Paintings dating to 2500 BCE depict people swimming in the River Nile (Figure 1), and the first recorded swimming races were held in 36 BC, in Japan. The mammalian dive reflex (known as “our inner dolphin” and exploited by free divers) allows us to exist underwater for extended periods of time. In recent years, swimming is receiving an explosion of interest, particularly by the aging population. Many baby boomers have discovered or re-discovered swimming as a challenging, yet non-weight-bearing exercise. Swimming works the great majority of the muscles in the human body. And, unlike many other “percussive” sports, people into their late 90’s are still able to exercise by swimming. So, swimming is super-popular! And I’ve always been curious as to how it actually works. Specifically, what are the mechanics of the catch and pull phases of the freestyle stroke? That’s what I set out to discover in this paper. My friend Carolyn kindly volunteered to be my subject. 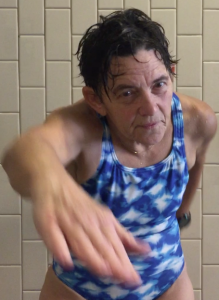 Carolyn is a recently retired, 65-year-old lifelong swimmer and swim coach. Two to three times a week, Carolyn swims approximately 2500-3000 yards in the pool. 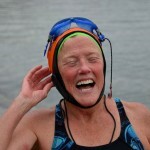 In recent years, she has also completed multiple open water swims of up to 7 kilometers in Lake Washington. To gather data for this paper, I used my iPhone to video Carolyn at both Medgar Evers and Rainier Beach public pools in Seattle, Washington. Filming her underwater proved to be too much of a challenge, particularly during the pull phase when I would need to film her from below. Besides, I was interested in obtaining clear documentation of the mechanics of just her shoulder and arm, not her entire body. Before describing the specific movements of the catch and pull phases, I’d like to provide a quick overview of the bones and muscles that freestyle uses. In general, freestyle stroke uses the bones and muscles of the shoulder girdle (clavicle and scapula) and arm (humerus, radius, and ulna). Most of the movements for the freestyle stroke also involve the glenohumeral joint, the ulnohumeral joint and radioulnar joint. The deltoid is the primary muscle involved in changing the position of the humerus, and thus the entire arm. The freestyle stroke is one of constant, repetitive rotation. There is really no beginning or end to the movement, and the stroke truly involves the entire body. In this paper, I isolate and analyze the movement of just one arm during the catch and pull phases. The actions are the same for the opposite arm. 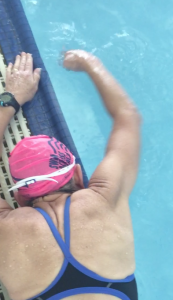 I am not going to describe the recovery portion of the freestyle stroke except to say that the same stabilizers (pectoralis minor, rhomboids, levator scapula, middle and lower trapezius, and the serratus anterior) work with the deltoid and rotator cuff to reposition the arm during that phase. From my research, I found that the serratus anterior is active during all phases of the entire stroke, providing ongoing stability to every movement of the freestyle stroke. Elbow flexion and extension also occur throughout the entire stroke. 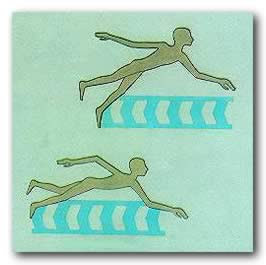 To allow the hand, wrist, elbow and arm to enter the water and set up for a powerful pull. Starting Position: The catch begins with the arm extended to its outer range in the superior transverse plane. The scapula, in upward rotation, works together with the clavicular portion of the pectoralis major to begin the arm’s eccentric contraction. From this position, the upper trapezius helps to elevate the scapula while the rhomboids retract it. The shoulder joint medially rotates as the deltoid holds the upper arm high. The elbow flexors begin to slightly concentrically contract. The wrist flexors hold the wrist in a position of slight flexion. Finally, the hand enters the water, fingertips first. (Figure 3). In the shoulder, the agonists are the pectoralis major, subscapularis, latissimus dorsi, and teres major. The antagonists are the anterior deltoid, coracobrachialis, and biceps brachii, while the rotator cuff (infraspinatus, teres minor, supraspinatus, subscapularis) stabilizes the entire shoulder. In the elbow, the agonists are the bicep, biceps bracchi, and brachialis, while the tricep acts as the antagonist. To propel the swimmer forward. The pull, (or as Olympian Sheila Taormina describes it, “the diagonal motion toward the body”) is the stroke’s power phase. Starting position: The pull phase begins in the anterior transverse plane. The full hand is submerged in the water, palm down and moving inferiorly. The scapula depresses and the shoulder stays in its medial rotation as the elbow concentrically contracts into approximately 30 degrees of flexion. At this point, the arm is moving below the trunk of the body, pushing backwards on the water. The trapezius and latissimus dorsi adduct the flexed arm toward the midline. Wrist flexors hold the wrist in a position of slight flexion. The propulsive forces generated by the lever rely on the scapula’s having a firm base of support. The pectoralis minor, rhomboids, levator scapula, middle and lower trapezius, teres minor, and the serratus anterior work together to stabilize the scapula. The clavicular portion of the pectoralis major and the latissimus dorsi generate the majority of force during the pull. The latissimus dorsi, pectoralis major (upper and lower fibers) deltoid anterior fibers, muscles of the rotator cuff, and the coracobrachialis act as agonists. The antagonists are the tricep and deltoid posterior fibers. The pull finishes with the hand exiting the water in the posterior transverse plane, at the hip. The wrist is in full extension with palm facing inferiorly. The subscapularis, superior middle deltoids, and supraspinatus are the agonists, while the biceps are the antagonists. The art of swimming is complex. It comprises multiple, simultaneous muscle movements. 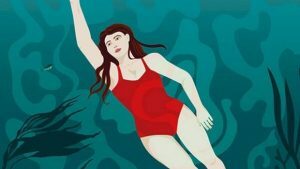 Contrary to widely-held beliefs and fears, swimming can be considered “natural” for the human body, and history shows us that humans have swum for thousands of years. Swimming is a skill that people of all ages, and many ability levels, can learn. Understanding how the shoulder, arm and wrist work together during freestyle may help both novices and advanced swimmers improve their stroke. Taormina, S. (2010). Swim speed secrets for swimmers and triathletes. Boulder, CO: Velo Press. Tough, A. (1979). The adult’s learning projects: a fresh approach to theory and practice. 1. Get outside early. To beat your competitors, start swimming outdoors early in the season. You should be able to complete 80% of your race distance in the open water two to three weeks preceding your event. 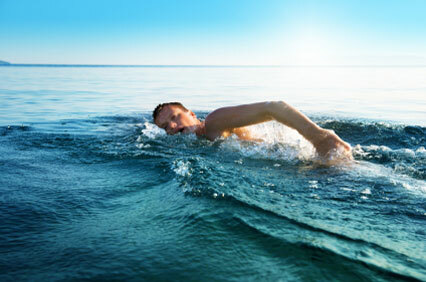 If you are combining your swim with a run, always swim first. 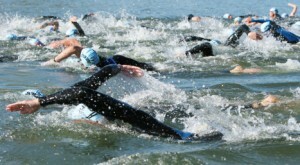 Triathletes who run first risk feeling uncomfortably cold in the water. 2. Use appropriate gear. The following gear will help you get a leg up on your competitors. Professionally fitted wetsuit. Eschew on-line purchasing; a careful fitting is important. 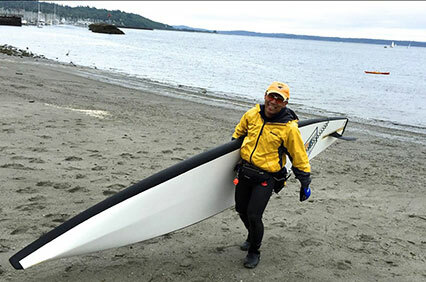 Warning: Although your wetsuit provides buoyancy, it is not a Personal Flotation Device (PFD). Wearing one will not save your life. Neoprene cap. This protects you in the early season. Pull a bright latex or silicone cap over it to increase your visibility. Silicon earplugs. Although earplugs can mute important sounds (like boat motors), they help to protect your main “computer”—your brain. Swimmer Safety Device. 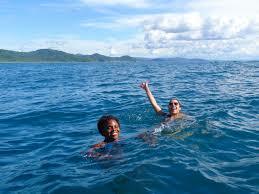 Swimmers can usually see boaters, but boaters often cannot see swimmers. Buckling around your waist and trailing behind you, Swimmer Safety Devices make you more visible in the water. Like wetsuits, they are not meant to be used as PFDs. (http://saferswimmer.com). 3. Swim with experienced paddlers. It’s best to train with a group, but even better to swim with an experienced kayaker. 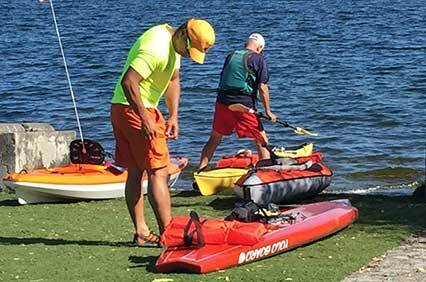 Your kayaker must carry an extra PFD for you. They should know CPR and carry a phone in case of emergency. Be an Animal. Challenge yourself! Keep track of your times, and try to beat them. Also consider joining the growing ranks of open water swimmers who swim year-round. These swimmers will welcome you with open arms. You may start to enjoy open water swimming instead of dreading it. Guila Muir is the founder of Say Yes! 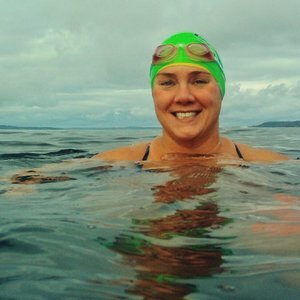 to Life Swims LLC, the Northwest’s premiere source of escorted open water swims. Join us to practice sighting and swimming in a pack while you test your endurance and open water skills! 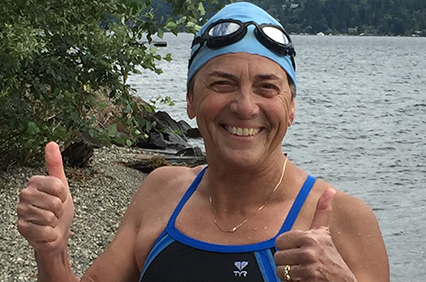 In 2016, several amazing Northwest women swimmers made news doing the nearly impossible. This forum will highlight their triumphant stories. Whether you dream of swimming in the open water yourself or simply want to learn more about this challenging sport, you are invited for a memorable evening. FREE, and open to all, this event is the first in a series of Springtime educational offerings. Say Yes to Life Swims is the Northwest’s only business providing Escorted Open Water Swim Adventures. 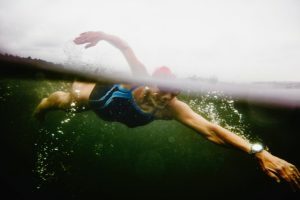 Sign up for the Say Yes to Life Swims Newsletter for tips and techniques to improve your open water swimming. See you in March! Braving the Open Water article is on pages 34-35. 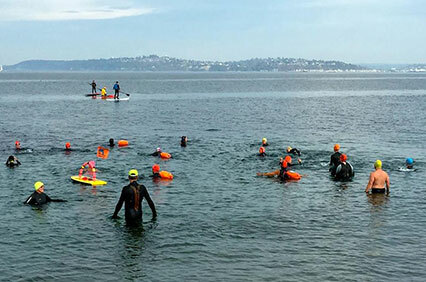 Learn more about how to prepare for the open water this season! Greetings! I’m writing this first Say YES to Life! blog post of 2013 to ramble a bit about my experiences with winter open water swimming. I’ll also talk a little about the “Conquistador de los Penguinos” (my friend Randy Perkins), and provide several resources for winter open water swimming. Although I’d always felt comfortable in the water, at 46 years of age I had never learned any strokes, never having had a swim lesson in my life. So I took my first lesson, bought my books, and became obsessed with learning as much as I could about swimming to make up for lost time. 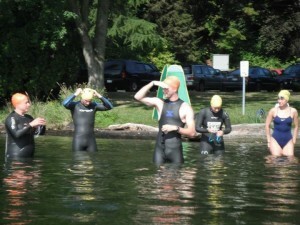 From my first tiny little swim in Lake Washington, I was absolutely hooked on the open water. I’ve now swum Alcatraz nine times and am preparing for a 10K swim in San Fransisco Bay in May. Almost from the start, I swam year round. In recent years, I donned my wetsuit on December first, and thought I was brave when I took it off on my birthday in March. This is in Seattle, WA, where ocean temperatures can dip below 45F. Air temperatures hover in the 30’s and 40’s for weeks in the winter. In 2012, a small group of us committed to support our friend Randy as he practiced for his swim across the Strait of Magellan. The swim was scheduled for January, 2013. Every Saturday, from the summer through the present, we meet at some frigid beach, strip down, and swim for up to 60 minutes in Puget Sound. Some of us wear wetsuits. Randy and I don’t. I see a growing interest in cold open water swimming internationally. There is an International Ice Swimming Association, and the annual Winter Swimming Championships have taken place for decades. More and more “regular” people are getting interested in the sport. While I haven’t yet gained credentials as an actual ice swimmer, my winter open water swimming adventures add a whole new dimension to my life. You can try it, too. Say YES to Life! Swims will add a few early Swim Excursions this year for the brave and curious. Just start making your showers colder NOW in preparation! That’s it for now. Say YES to life, and happy swimming to you. Welcome to Say YES! to Life Swim’s first blog post. Our motto is “discover the joy of swimming.” Our blog is for those who already love open-water swimming, as well as those who want to experience it for the first time. 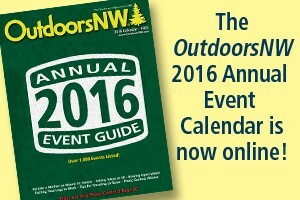 Our readership includes both open-water novices and experienced triathletes. 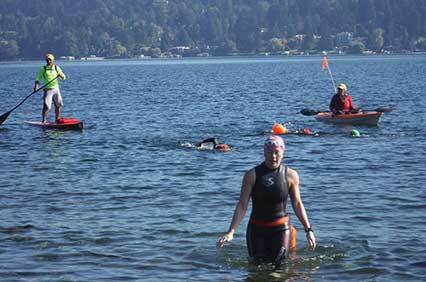 Supply hints and tips to improve your open-water swimming. Update you about Say Yes! to Life’s scheduled swims. Provide information about open-water swimming around the world. As an open water swimmer or a triathlete you should be training as a distance swimmer, looking to develop your fitness for best performance over distances of 800m and longer. In their training sets they perform short very fast swims with lots of recovery. (Masters teams commonly use this sort of set.) A set might be 15x 100m with 45 seconds recovery. They do not train for fitness at all, believing that stroke technique is all important. While stroke technique is very important in swimming, you need to be able to sustain your technique over longer distances. Thank you, Paul—you’ll get us all swimming longer sets in the pool in preparation for our open-water swims. Happy swimming from us all at Say Yes! to Life Swims.